"Charlie Bartlett" (2007): Wealthy teenager Charlie Bartlett was just expelled from his last chance at private school for pedaling fancy, fake I.D.s to his peers. Now, it's time for a go at public school, where he meets sweet, rebellious Susan Gardner (Kat Dennings), school Bully Murphy Bivens (Tyler Hilton), and Susan's father Principal Nathan Gardner (Robert Downey, Jr. in a role that was likely written with him in mind). This movie seems like a kid movie and was poorly marketed to play out like one. It is, in fact, rated R, and there's nothing 'kiddie' about it. Its titular character is played by Anton Yelchin, whose convincing turn as the shaken, good-natured teen comes leaps and bounds from his role in the heinous "House of D." Charlie, in an innovative plea for popularity, begins to hold counseling sessions in the boy's bathroom while selling prescription drugs to his troubled classmates. Downey gives a provocative performance as the alcoholic principal who fears his job and his students. Coming off a bad divorce and even a stint in rehab, Nate Gardner and his plight as father/principal/mentor are a driving force for much of the film's tension. 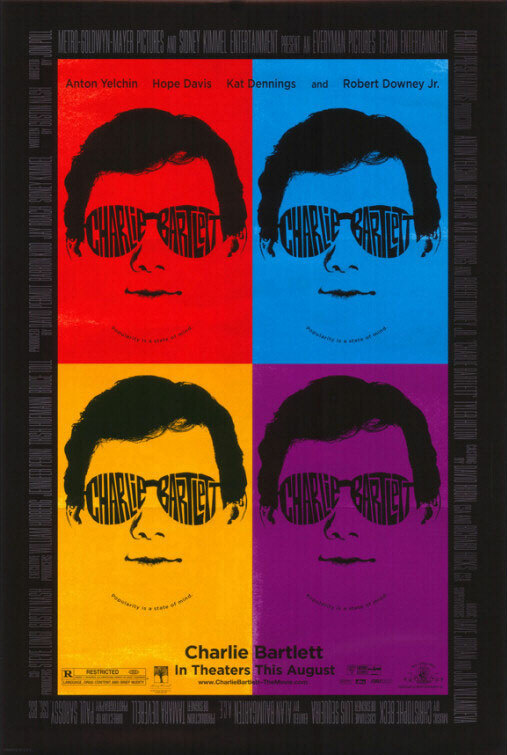 "Charlie Bartlett" is full of humor, and also sensitivity to the touchier subjects that teenagers have always faced, including depression, peer pressure, sexuality, and low self esteem. It also stars Hope Davis as Charlie's daft and medicated mother. This was an excellent movie. "In Bruges" (2008) I reviewed this movie several months ago, and now it's finally on DVD. Colin Farrell and Brendan Gleeson play Ray and Ken, Irish hitmen sent into hiding in Bruges, Belgium after a hit goes terribly wrong. Much of the movie revolves around the ennui of Bruges, known as the most well-preserved Medieval city in Belgium, where fat Americans attempt to climb narrow bell towers and the most exciting thing to do is sight-see. "In Bruges" is dark but mostly comical, delving heartily into the wealth of talent in its cast. Ralph Fiennes is droll and vile as Harry the boss in London. Colin Farrell is daft but troubled, shouldering an albatross that I won't give away to you here, and Ken is the jaded widower who has seen and done most evil in the world and has now come to a considerable bargain with it all. Fanciful, whimsical, like a sort of fairy tale movie, "In Bruges" is wildly entertaining, to say the least. "I'll Sleep When I'm Dead" (2003) Clive Owen is always skilled at giving surly madmen a certain vulnerability that distinguishes the serial killers from the misunderstood. His characters are often misanthropic hero types with hearts that have hardened almost completely, aside from one sink hole made of something in the past. I refer most specifically to his characters in "Shoot 'em Up" and "Closer," as well as in this little number. "I'll Sleep When I'm Dead" is a cold and distant movie about a man who disappears for several years only to return upon his brother's mysterious death. It's obvious that there's a "History of Violence" thing going on, because unidentified mob members and local pools of gossip have him pegged as a once-violent man who will go to any length to achieve his revenge. Ultimately, "I'll Sleep" is a story of transcendence and the familiarities of the past, which can sometimes fool us into thinking that change is impossible. "Wonder Boys" (2000) Here is a film that, if you haven't seen it, you're missing something incredible and living and evolving and just like everything you could ever hope to encounter when watching a movie. Michael Douglas is in rare form as Grady Tripp, an aging novelist/Creative Writing Professor at a small, New England college whose last novel "The Arsonist's Daughter" struck gold seven years ago...and has yet to see a successor. "Wonder Boys" is but one slice of this difficult man's life. In it, he takes under his wing a troubled student named James Leer (Tobey Maguire) whose talent for fiction-writing vastly outweighs his talent for social situations. They come together at a cocktail party for Word Fest, a fancy sort of event in which writers and related literati congregate to celebrate all that is...words. Sooner or later, Tripp's editor shows up, the sardonic and intermittently gay Terry Crabtree (Robert Downey, Jr.). He's got a six-foot-tall transvestite named Antonia on his arm and a quickening desire to get ahold of Tripp's new book. The problem is, however, that the new book, at roughly 2600 pages, is nowhere near fruition. Plus, Tripp's wife just walked out on him, not to mention the affair he's been having with the Chancellor's wife (Frances McDormand). To put things simply, he's been quite unable to concentrate lately, and the result is a fantastic movie about the epiphany of one man and the people that surround him.